I believe in Africa - Do you? Smart cities are defined as developed urban areas that create sustainable economic development and high quality of life. It sounds straight forward, though how this manifests practically in developing economies such as those in much of Africa is very different from the high tech expectations created in the developed world. In response to meeting the expected demand of the future populous – and the standards for sustainable urbanisation set out in the United Nations’ New Urban Agenda, Habitat III – The African Union (AU) developed Agenda 2063. But, how will we get from the current state to that envisioned in the Agenda 2063 – for a united and prosperous Africa? 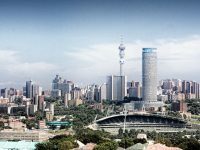 To address this question, experts from WSP in Africa have shared their insights on leveraging the transformative power of urbanisation to seize opportunities and build an impactful legacy for the future of Africa’s cities. A World Bank report highlighted that there are three key and reoccurring challenges with Africa’s rapid urbanisation; the cities are too crowded, not integrated, and it is expensive to live in African cities. To meet the standards set in the New Urban Agenda, cities in Africa must become far more reasonable for people to thrive and environmentally friendly. “In Africa and if we are going to achieve the aspirations laid out in the Agenda 2063, there needs to be more focus on infrastructure development that will support sustainable cities that are totally integrated – and cities that are ‘people’ focused. This will mean reviewing all current infrastructure plans and projects to understand what is the socioeconomic and environmental impact of these,” adds Groves. Phahlane recognises there are infrastructure projects and plans being implemented, or are in the pipeline, however believes that the effective implementation of infrastructure projects should be considered in earnest – of what will benefit people, communities, trade and industry. “We should be undertaking an economic impact assessment process to understand the ‘real potential’ socio and economic impact and, if based on this, the projects currently being fast-tracked are in fact the right projects – that will add to the long-term resilience and sustainable inclusive economic growth for future societies. This will better enable us to design projects based on what the future demand on infrastructure networks will be – to allow us to potentially leapfrog current implementation constraints and get ahead of the demand curve that will support sustainable development and growth going forward,” says Phahlane. The New Urban Agenda has placed significant focus on how people will move within and between cities. Futureproof planning therefore means that the bigger picture must involve the integration of major transportation infrastructure projects with provincial and municipal development. It must also consider planning for and the development of the critical mass of support infrastructure that feeds into and from the primary infrastructure. “Public transport infrastructure therefore still has a crucial role to play in the future of African cities. It’s not surprising that plans to expand all modes of public transport is on the development agenda for most African states. However, these expansion plans will only be affective and successful as they are integrated into the larger regional and cross-regional transport networks. Changing how we think about, plan, design and build integrated public transport networks will bode increased confidence by people – and towards effecting positive change in mindsets about the reliability, safety and comfort of public transport solutions,” adds Phahlane. “We cannot escape that we are living in a world that is increasingly being transformed and driven by advances in technology. To ensure we are not left behind in the latest revolution, we must embrace technology and ensure that our cities are technologically enabled and powered. This will drive immense opportunities for people living in our cities to have access to services, but also information. More connected and informed city dwellers will make help make our cities smarter,” says Phahlane. Digitalisation presents incredible opportunities for African nations to leapfrog some of the traditional development trajectories. While in its infancy in Africa, improving cost effective Internet access and adopting digital technology could drive radical changes that can boost access to social infrastructure in the short- to medium-term, such as e-Learning and e-Health services, for example. Furthermore, in the long-term, embracing disruptive innovation as part of the process to deliver complex and sustainable projects presents opportunities to implement changes now that will transform how we view and use infrastructure, ensuring that it is enriched and futureproofed. Climate change and changes in and extreme weather events present inevitable risks that African nations will be faced with. “Given the scarcity of access to resources, many current basic services infrastructure plans are reliant on one solution. For example, one water solution, or one energy solution. However, this poses eventual risks to a city’s supply services,” says Groves. “We need to understand that without intervention the urban form of the city will not rapidly and materially transform itself towards being more efficient and sustainable. Going forward and as we look to adapt our cities to be more low carbon cities, we need to look at diverse solutions – things that network with each other, but can operate independently – and that promote resilience, particularly considering climate change to come,” adds Groves. WSP believes that to develop a sustainable city, the barriers of isolation must be broken down and a holistic and integrated design must be considered upfront; including transport, future energy, climate change strategy, water, waste management and socio-ecological systems, housing, etc. as well as intelligent systems powered by telecommunications and technology adoption. “Building a smart, sustainable city is a complex undertaking for any economy. On a microeconomic scale, a town or city has layers of impact that extend far beyond the boundaries of individual building projects, including on the atmosphere, built environment, urban infrastructure, natural attributes, and social impacts, etc. It is only when we design and plan for the homogenous growth of all these layers together that we will achieve future cities that are ergonomic, more sustainable and innovatively smart for a future where society can really thrive,” concludes Groves. I believe in Africa – Do you?